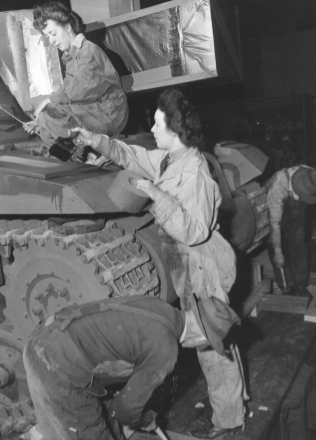 The formation of the Canadian Women’s Army Corps during the Second World War is a milestone in the history of women’s participation in the Canadian military. There were few precedents. Prior to 1939, Canadian women served as nurses in the Northwest Rebellion (1885), the South African War (1899-1902) and the First World War (1914-1918). In 1918, military headquarters in Ottawa considered organizing a “Canadian Women’s Army Auxiliary Corps” to provide administrative and clerical support to the forces overseas, but the war ended before anything could be done. Twenty years later, as international tension mounted, a group of women in Victoria formed an organization eventually known as the British Columbia Women’s Service Corps. Inspired and organized by Joan B. Kennedy, this volunteer movement trained in auxiliary roles such as first aid, motor mechanics and military clerical duties. Yet, women in the Canadian military remained conspicuous by their absence. In September 1939, Canada went to war. Within months, dozens of unofficial women’s corps, with thousands of members, organized across the country. These keenly patriotic women joined such groups as the Women’s Volunteer Reserve Corps, which operated in Québec, Ontario and the Maritimes, or the Canadian Auxiliary Territorial Service, which operated in Ontario and the western provinces. On their own time and at their own expense, these volunteers enrolled in military-related courses like Morse code signalling and map reading. Joan Kennedy’s group in British Columbia learned “regulation infantry drill” in militia armouries, while in Montreal members of the Black Watch (Royal Highland Regiment) of Canada trained the Women’s Volunteer Reserve Corps in arms drill and physical conditioning. The women wanted to be taken seriously. This was a “total war”, they argued, demanding a total effort by all Canadians. 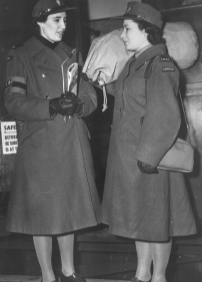 Up to the summer of 1941, they lobbied Ottawa repeatedly to form official women’s auxiliary services for the armed forces, correctly claiming that their members would make excellent recruits. Joan Kennedy, patriotic and energetic, was the driving force behind this groundswell of demands by Canadian women to serve their country. The important place of women in all three British armed services helped fuel their insistence. Britain’s example should have convinced the men directing the Canadian war effort of the value of women’s military service, but old attitudes died hard. The images of ‘women as warriors’ did not fit most mid-century gender stereo-types. What would happen to the family unit, asked sceptics, if both men and women were off serving their country? Industrialization had already drawn thousands of women into the paid labour force since the turn of the century and the war attracted hundreds of thousands more. Their skill and professionalism changed some minds, but the military establishment would prove a particularly tough nut to crack. Adiminishing supply of male labour and two years of Allied defeats helped force the issue, but it was mainly concern about the tightening supply of manpower for the rapidly expanding Canadian forces which overcame any lingering doubts in Ottawa regarding women’s military service. Women could replace men in non-combat duty, thereby freeing soldiers for service at the front. On 13 August 1941, the government authorized the formation of the Canadian Women’s Army Corps (CWAC) to enlist several thousand women in support roles for the armed forces. Segregation by gender remained overt: the Corps was not formally part of the army nor subject to military discipline. Even rank designations and insignias did not follow army practice. Still, it was a step forward. Women trained as drivers, cooks, clerks, typists, stenographers, telephone operators, messengers, and quartermasters. Many had gained useful experience with one of the unofficial women’s para-military organizations formed between 1938 and 1941. The employment of female personnel as members of the army, while they belonged to a quite separate organization, created administrative problems. These were finally resolved on 13 March 1942 when military authorities integrated the Canadian Women’s Army Corps into the Canadian Army. With its new status, the Corps adopted army rank structures and insignia. CWAC members wore a cap badge with three joined maple leaves. On their collar badges appeared the helmeted head of Athene – Goddess of War. Creation of the CWAC was part of a wider trend in the Canadian military. The army had been preceded by the Royal Canadian Air Force (RCAF) in creating a distinct but integral women’s service, eventually known as the Women’s Division of the RCAF. The Royal Canadian Navy followed in the summer of 1942 with the Women’s Royal Canadian Naval Service. National Defence Headquarters (NDHQ) in Ottawa appointed Elizabeth Smellie, formerly Matron-in-Chief of Canada’s Nursing Sisters, and an experienced military administrator, as the first Officer Administering, CWAC. Smellie recruited directly from the existing patriotic women’s organizations for her officers. Fittingly, Joan Kennedy was among her first senior appointments; in fact, Lieutenant-Colonel Kennedy succeeded Smellie in the fall of 1942 with the new title of Director, CWAC. In May 1943 NDHQ replaced the position of Director with two separate positions: Kennedy became the General Staff Officer in charge of CWAC training and Lieutenant-Colonel Margaret Eaton, of the well-known Canadian family of department store owners, served as Assistant Adjutant-General, CWAC. In April 1944, Ottawa reverted to a single leadership position for the CWAC and Eaton, a 31-year-old acting colonel, assumed command as Director General. She held this appointment until October 1945. Women joined the Canadian Women’s Army Corps for a multitude of reasons. Outright patriotism was one. “There is no doubt in my mind that patriotism was my main motive for joining the army”, one CWAC recalled, “…I had already been working in a munitions plant, but I decided that wasn’t enough.” Others joined because their friends had enlisted or were planning to do so. Like men, some women joined for adventure. “Getting overseas was the ultimate for everyone – to get closer to the action” said one. “Of course, we didn’t know what it was really like. It was just the idea of the excitement and adventure of it all.” A February 1943 CWAC advertisement in the Edmonton Journal noted that prospective recruits had to be in excellent health, at least five feet tall and 105 pounds (or within 10 pounds above or below the standard of weight laid down in medical tables for different heights), with no dependants, a minimum of Grade 8 education, aged 18 to 45, and a British subject, as Canadians were at that time. At first, 30 military trades were open to women, a figure which eventually reached 55. Many paralleled women’s gender-specific employment in civilian or domestic life, such as cooking, laundering, and clerical duties. However, like many wartime female industrial workers, service in the CWAC enabled uniformed women to learn skills and acquire training unusual for women at that time, including, ciphering and decoding, vehicle maintenance, and signalling. Some CWACs engaged in range-finding and spotting duties for anti-aircraft units stationed in Canada. Nevertheless, most held military versions of office jobs. Historian Ruth Roach Pierson has written that “the clerk or secretary in uniform was the typical CWAC“. Most CWACs underwent basic training in Kitchener, Ontario or Vermilion, Alberta. From February 1942, advanced officer training took place at Ste-Anne-de-Bellevue, Québec. Many women in the CWAC found military life quite agreeable. A survey conducted in early 1943 revealed that the majority of women enjoyed the camaraderie that developed in barracks; they also enjoyed travelling and meeting people from all parts of Canada. They became more self-confident and believed that military life exerted a positive effect on their health and moral outlook. They were proud to belong to the CWAC and to wear its uniform. Moreover, many felt the trades’ training they received would be of use in their postwar careers. Still, there were problems. Some CWACs resented the fact that, though they were replacing men and often doing the same work as men, they were not receiving equal pay or dependants’ benefits. From the beginning of the Corps, a CWAC private received just two-thirds of a soldier’s wage for similar work (about 90 cents a day versus $1.30). In 1943 this proportion was raised to 80 percent. Few women complained. As one former member recalled: “We got paid less than men, and our generation accepted it without even thinking about it, because we’d been brought up to expect less than a man.” While disparities remained, the CWAC operated on a more equitable basis than most of Canada’s private industries employing men and women doing the same work. The CWAC leadership generally felt the salary issue was handled fairly since CWACs did not have to stand on guard duty nor be exposed to the training or operational hazards which many male soldiers faced on a daily basis. The emergence of a large group of capable, self-confident female soldiers created some social tension. Many people believed a women’s place was not in uniform, but in the home. In early 1943, the army experienced a substantial decline in female enrollment. To discover the cause, Ottawa hired a polling firm to conduct a national public opinion survey. The results were startling: only seven percent of respondents believed that joining the military was the best means for Canadian women to contribute to the war effort. The polling further revealed that many Canadians, men and women, held a dim view of women who did join the armed services, generally believing that only “loose women” with low moral standards joined the military. Civilian hostility could be insulting and harmful to morale. “If people saw a boy and a girl walking hand-in-hand…together they’d say, ‘Oh, look at that nice young couple. '”, one CWAC remembered. “But if the girl was in Army uniform, they’d say, ‘Oh, look at that cheap CWAC . '” The army exerted much energy in order to focus public attention on the valuable contribution made by the Canadian Women’s Army Corps to the war effort. The women had proven their value and most army sceptics, at least, were silenced. The first CWACs to serve outside Canada were those taken on strength of the Canadian Joint Staff in Washington, D.C. in 1942. That summer, Canadian Military Headquarters (CMHQ) in Britain requested the services of 350 CWACs; the first draft arrived on 5 November 1942. Canadian soldiers, many of whom had not been home in years, were among those offering the warmest welcome. (Male colleagues at CMHQ, who might end up in the front lines if replaced by CWACs, were sometimes cool to their arrival.) The press paid attention as well, writing feature articles about the CWACs and filming and photographing their arrival and living quarters. By December 1943, there were three CWAC companies in London and one in Aldershot with Headquarters, Canadian Reinforcement Units. A further 173 women served with No. 1 Static Base Laundry. In London, the CWACs served with various branches of CMHQ, performing an ever-widening array of tasks as the war progressed. Their utility and professionalism exceeded the expectations of many of their male colleagues. In the spring of 1945 Ottawa decided to send some CWACs into rear areas of the war zone in north-west Europe, mainly to act as clerks with headquarters units. (The first members of the Canadian Women’s Army Corps to enter a theatre of war, however, were the four who were part of the Canadian Army show which landed in Italy on 16 May 1944.) Only 156 CWACs served in north-west Europe, and 43 in Italy, before the Germans surrendered on 8 May 1945. In the months following the Allied victory, hundreds more CWACs served in Europe working on the complex task of repatriating the army to Canada. Others served with Canadian occupation forces in Germany. In all, approximately 3000 served Canada overseas. While no members of the CWAC were killed due to enemy action, four were wounded in a German V-2 missile attack on Antwerp in 1945. In August 1946, the fifth anniversary of the founding of the CWAC, Brigadier-General W.H.S. Macklin, the acting Adjutant-General, addressed a message to all ranks of the CWAC which read in part, “During the past five years you have established an enviable record of devoted and efficient service and as you ‘stand down’ you look with justifiable pride on your achievements. Now with your task completed, your objective attained, we are confident that you will carry into your homes and communities the same fine spirit, the same enthusiastic service you have shown in the Army – remembering always that as citizens of this great Dominion you have an equal responsibility in peace as in war.” Despite the desire of many women to remain in the military, the authorities deemed women’s services no longer necessary in peacetime and disbanded the Canadian Women’s Army Corps on 30 September 1946. Ottawa also stood down the women’s services in the air force and navy. 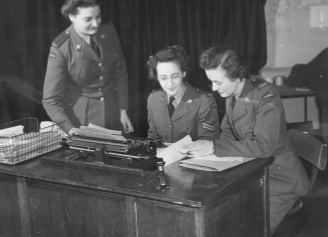 In a little more than five years, 21,624 Canadian women served in the CWAC. Military historian C.P. Stacey wrote: “Although its formation had been undertaken belatedly and not without some misgivings, it had proved a triumphantly successful experiment. Without the CWAC, Canada’s manpower problem would have been considerably more difficult of solution.” He might have mentioned that in addition to freeing men for combat duty, the CWACs proved themselves efficient and competent soldiers in all respects. Their example helped set the stage for the integration of women into Canada’s postwar armed forces. Jean Bruce, Back the Attack! Canadian Women During the Second World War – At Home and Abroad, Toronto, Macmillan of Canada, 1985. W. Hugh Conrod, Athene, Goddess of War: The Canadian Women’s Army Corps – Their Story, Dartmouth, Writing and Editorial Services, 1984. Geneviève Auger and Raymonde Lamothe, De la poêle à frire à la ligne de feu: La vie quotidienne des Québécoises pendant la guerre ‘39 – ‘45, Montréal, Boréal Express, 1981. Carolyn Gossage, Greatcoats and Glamour Boots: Canadian Women at War (1939-1945), Toronto, Dundurn Press, 1991. Ruth Roach Pearson, “They’re Still Women After All”: The Second World War and Canadian Womanhood, Toronto, McClelland and Stewart, 1986. Kathleen Robson Roe, War Letters from the C.W.A.C., Toronto, Kakabeka Publishing Co, 1975.